Free "drop in" event for private landlords and letting agents dealing with common repairs in flats of all types and ages. This is one of a series of similar events taking place across Scotland - if the timing of this one doesn't suit you please feel free to book into one of the others. Speakers include Annie Flint and John Gilbert (Architect), authors of the highly acclaimed impartial website Under One Roof Scotland. Once booked, please feel free to arrive in time for any talks that suit you and take the chance to ask questions of exhibitors whilst waiting. Talks are repeated afternoon and early evening. What is Under One Roof Scotland? 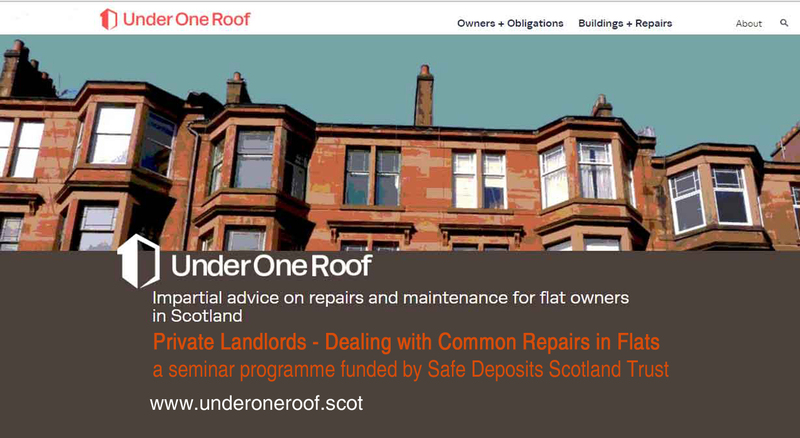 www.underoneroof.scot is a free and impartial source of advice for flat owners of all types in Scotland. Our pages directed at private landlords may be of particular interest to you. The website is funded and managed by a partnership of local authorities, Scottish Government, private property factors, housing associations and Historic Environment Scotland. Under One Roof emails occasional (approx 4 each year) newsletters to subscribers. These newsletters include answers to questions raised by our users, details of changes in legislation affecting flat owners and landlords, seasonal reminders and relevent event listings. Tick the email consent box on the ticket booking page or on the right hand side of most pages on the Under One Roof website to have your email added to our list - you'll be able to unsubscribe at any time. How is the event supported? This event is funded by the Safe Deposits Scotland Trust and we are grateful for their support and that of West Lothian Council who assisted with event set up and contacting landlords.